In July-August 2017 we – me and my wife together with our daughter and our Czech son-in-law and his parents – spent a weekend in the Sumava National Park in southwestern Bohemia. We stayed at the pittoresque small town of Kasperske Hory, hiked in the surroundings and further away in most tremendous landscapes. We also visited nearby towns as Susice and smaller locations enjoying good food and coffee. Although it was very warm and dry and the water level of tributaries of Otava, like Vydra and Kremelna was extremely low, Otava itself was running higher and the water temperature wasn´t too high. That´s when I came up with the idea of a flyfishing trip to Sumava. I would be 70 next spring, so I thought it would be a nice birthday present to get. It was okayed by the family. I soon found out that making that trip on my own would be a failure, so I started searching a local companion. It´s not hard to guess that the person I was looking for would be Jan Šiman – a wellknown professional flyfisherman running Goflyfish.cz and a small fly shop in Susice. I chose a week´s stay – being the only pupil in Jan´s Master Class – in the last week of May. It was an all-inclusive package with board and lodging and fishing gear. Booking flights and a rental car was the next move. Susice is easy to get directly from the Prague airport. You may choose between two routes, one via Plzen, another via Strakonice. I chose the first one, but soon found out that when getting off motorway into smaller roads travelling was every once in a while stopped by roadworks in small towns and villages. It wasn´t bothering me, because I wasn´t in a hurry. Getting there took some 3 hours including a lunch brake. – The way back was faster via Strakonice. Though it took some time to get out there and find the right route to Prague. Arriving in Susice early on a Friday afternoon I met Jan, a tall guy with a friendly smile. After a short chat we started driving towards Annin, my base camp. We were in the car park of Penzion Jana – a modest inn- in about 20 minutes. Having had a plentiful supper we agreed that next morning I would drive back to Susice to have my fishing permit done. Jan had already chosen a #4 rod and reel for me. The river Otava, a tributary of Vltava is some 110 km long. 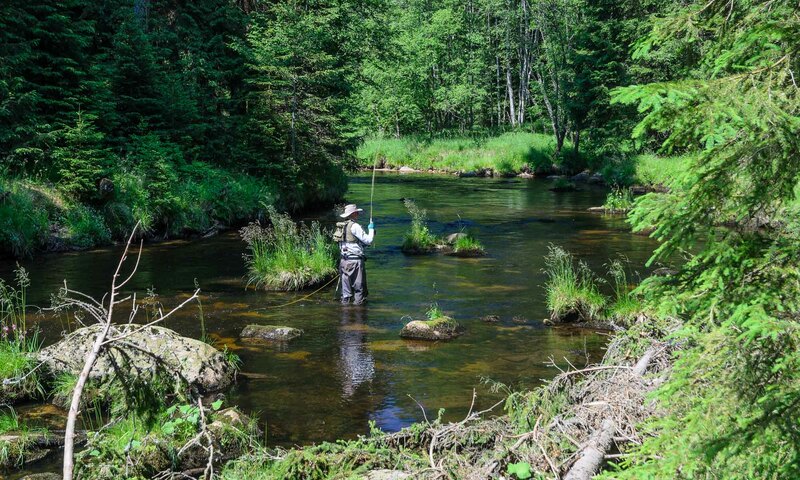 Brown trout and grayling breed in Otava, rainbow trout and brook trout are stocked. Most of the beats are c&r and you can find them where there´s a sign to a roadside camping site. The pools are very different by nature: in Susice area the river is channel like, at some places a narrow brook with deep holes or as wide as 30 meters. Normally you need just one permit, but there is the trophy zone with an extra charge. That´s were you most certainly have your permit checked, too. A trophy zone is one where the big fish, mostly rainbows are lying. Jan told me that sinking line with a heavy streamer would work best. The temperature during the week was high, 28-31 centigrades, water in the river 16-17 centigrades. My arms were sunburned on the first day. At the end of the week there were some thunder with heavy rain upstream turning the then clear water into the colour of caffe latte with lots of debris on the surface. Canooing is very popular in Otava. During the first weekend I fished with Jan and Martin, another guest from Prague and no other fishermen. Otherwise just canoes floating down the river one after another so you had to take care not to be run over. To be honest, they steered their vessels past you far and wide especially when seeing you play a fish. From day one Jan taught me the techniques of Czech nymphing – originally it was Polish Jan told me and it was developed further by Czechs. Now even they have changed for French nymphing which is not far from the Japanese tenkara. In modern Czech nymph fishing you use to heavy nymphs and a short – 20-25 cm piece of furled leader painted red and green with a water resistant marker as a strike indicator. Leader length is roughly that of the rod, tippet strength 0,12 mm. You cast upstream and let the flies swim freely downstream keeping the indicator visible in the surface during the cast. This is how you ensure that the flies keep their depth the same as long as possible. When the indicator stops on a take or when you lift your line for your next cast you strike back – sideways. That way you hook the fish almost 100 %. My back strikes were almost 100 % upwards. That habit is deep in your backbone and is not easy to learn off. After many failed attempts I got my reward netting a real beauty: very nice 47 cm grayling, the biggest of my week. I visited the trophy section (Otava 6 Cepice) twice. On the first day Fortuna only showed me her backside: I had really many takes hooking one capital rainbow after another but losing them all, some just half a meter off the net. Back in Penzion Jana calming down required two large beers. Next morning I drove to Susice and told Jan that I had some unfinished business in the trophy zone and asked him to print me another special permit. He had some work to do that would keep him busy all day, but I could go alone, because I knew the place. For that purpose he had advised me to install a mobile navigator app called Maps.me which I did. Then he mailed me all his Otava fishing spots which I in turn loaded in the app. It proved very handy, indeed. Recommendable. Second visit proved very successful: during the day I landed 6 or 7 large rainbows and one brook trout losing only one or two fish. All with a heavy trout-streamer and sinking line. All fish were lying under the tree shadows on the opposite bank. The fish though being trophy size – largest above 2 kg – weren´t, unfortunately, of best quality, which you were told by their fins and tails. Typical defects of farmed fish. Despite that they got the reel singing. I don´t want to repeat the merits of Jan as a team member of Czech world cup winning competition anglers – others have already done that. To me Jan is an exceptionally good and patient person when giving instruction and useful tips. Moreover, he also is one of the most innovative fly fisherman I´ve known. There are always surprising things in the pockets of his fly waist to use if conditions change – and he first sees or feels the change. Many of his innovations have materialised as new products. Hopefully, I´ll still have the chance to visit Sumava, fishing Otava and its tributaries once again in the guidance of Jan Šiman. You´ll find him at Goflyfish.cz.